Ideal for indoor and outdoor use, the Excelvan Portable Electric Barbeque Grill provides quality temperature settings, a non-stick surface that is easy to clean and overall quality cooking potential. The main feature of this grill is having the ability to prepare your favorite grilled foods indoors and outdoors. Continue to grill year-round as you can enjoy a nice day grilling outdoors or cook inside the kitchen with your grill when the weather outside is unfavorable for grilling. With an affordable price and all the features, it makes perfect sense to choose their grill for your cooking needs. This Excelvan grill offers a large cooking surface with adjustable temperatures for quality cooking inside or outside the home. Operated with 1350W power, the grill features five temperature settings. Easily prepare your favorite foods at the temperature required for these settings. Preheat time is just ten minutes, allowing you to begin cooking quickly. The cooking surface of this grill is quite large so you can prepare foods for large groups or make enough to have leftovers. More than 15 servings can be prepared on this grill. The plate is specially designed with a flat hot plate on 1/3 of the grill and the remainder is a ribbed griddle. Cook chicken, hamburgers, steaks and more to perfection with this grill. This grill was created with convenience in mind. Not only is cooking easy to do but cleaning is also a breeze. When cooking, the grill has features such as attachments that are useful during the cooking process. A hanging basket is located at the bottom of the grill to place your condiments or cooking needs. You can hang the attachments included with this grill off to the side in order to grab the utensil you need during cooking. This ease of use makes it nice to grill without searching for just what you need during the cooking process. The Excelvan Portable Electric Grill is also easy to clean. Anyone who is an avid griller knows that cleaning up after cooking can be time consuming and annoying. This grill has a non-stick cooking surface consisting of die-cast aluminum for easy cleaning. Little oil is required during the cooking process. Drainage holes are located on the surface that is sloped so that fat and grease drain away without collecting on the food. The removable grease tray makes it easy to clean up the fat and grease after cooking, plus you have a healthier meal! This Excelvan Portable Electric Grill is highly rated at Amazon. At the time of writing this review, the grill had received 4.6 out of 5 stars. However, there were only 8 reviews available on the grill. 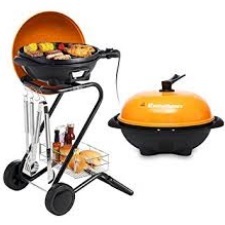 Unlike other grills with hundreds of reviews, this one does not have as much consumer feedback to go on. Overall, more than 88% of those who have purchased this grill and reviewed it gave the unit 5 stars. As far as negative reviews are concerned, the lowest rating is 3 stars. The consumer complained of not having the bolts needed to complete assembly and does not suggest using the grill indoors. It seems that the majority of those who purchased this grill would recommend it to others as it is easy to use, quick to heat and cooks barbeque foods well. When looking at the reviews of the Excelvan Portable Electric Grill for indoor and outdoor use, all signs point to this grill being a good buy. At an affordable price point, easy to use and quick cleaning capabilities, consumers can benefit from purchasing this grill. Perhaps the best feature of the portable grill is that fact that it can be used both indoors and outdoors. Having the ability to cook wherever you like is certainly a plus. Many outdoor barbecue cookouts have been ruined due to bad weather. With this grill, if bad weather arises, you have the ability to cook indoors. This is very convenient and allows you to avoid having to postpone any events or gatherings you have planned.